After a long and very busy spring and early summer, I finally dusted off the sewing machine (or, more accurately, excavated it from beneath a pile of clothes) to begin a few projects. First on the agenda was a dress for an upcoming research trip. I will be in the Mediterranean area, so it will be quite hot, and I’ve decided to pack a few dresses for comfort. 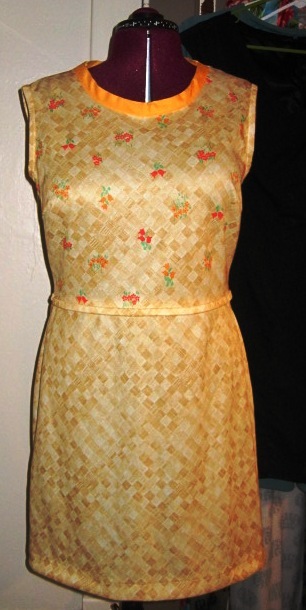 I used Simplicity 9175 from 1970, a simple shift dress with sleeveless and short-sleeved variations. I have made this pattern before with some success, though the dress was a bit too large, particularly in the back and shoulders. I discovered that I could slip the dress on and off without unzipping it, so I decided to make it without the zipper, which would be quicker and also more comfortable for travel. 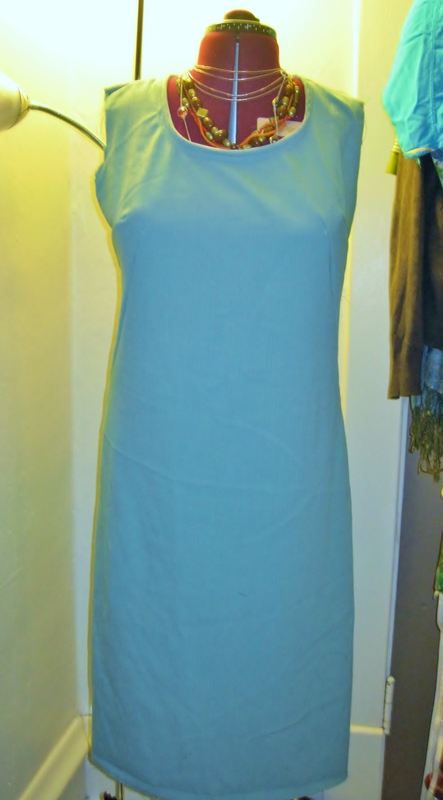 I used a medium-weight aqua linen blend that I had in my fabric stash. It is a bit heavier than I would have preferred, but I liked the color and the crinkly texture, which will hide wrinkles. Since the fabric frays like crazy, I used French seams (I’m not ready to get out the serger quite yet), which I love. I fixed the neck issue in the previous dress with larger darts, which solved the problem. As I am generally lazy and impatient when it comes to sewing, and I hate making facings, I tried using bias tape instead. I had nothing that matched well so I ended up using a pale pink fleecy tape that I had left over from a project for one of my nieces. 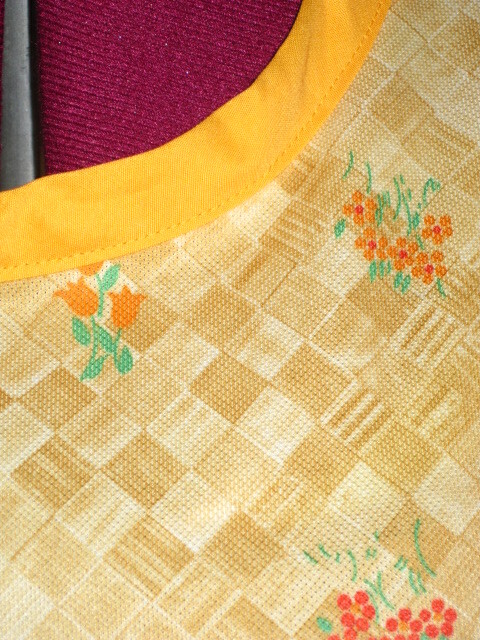 This technique didn’t work as well as I’d hoped, in part because the nap of the bias tape made it rather bulky, so I might redo the neck with quilt binding–my favorite super-easy neck finishing technique. I had planned to make sleeves, but I’m having trouble fitting them properly so I might make it sleeveless instead. Anyway, here is what I have so far. I’m washing it now to see if washing and drying will improve the neckline, but I have my doubts. On the plus side, the dress fits perfectly–it is easy to pull on but the darts make it fitted enough that it doesn’t look overly frumpy. It will work belted or unbelted, and it can be layered over a shirt or under a button up shirt or sweater. Perfect for travel. Now I just have to finish it. I had just enough fabric left over from my wrap dress to make a gored skirt from one of my recently-acquired vintage patterns, dated 1979. The pattern is super-simple–just four identical pieces. I bought some pattern material at the fabric store a couple of days ago. It is not really paper but more like thin interfacing (which is actually what I was looking for when I found it). I was so excited that I bought five yards of it at $2.49/yard, minus a 40% off coupon. This stuff is a dream. I traced the skirt pattern onto it and found that it is incredibly easy to cut and does not crinkle up like tissue paper patterns. 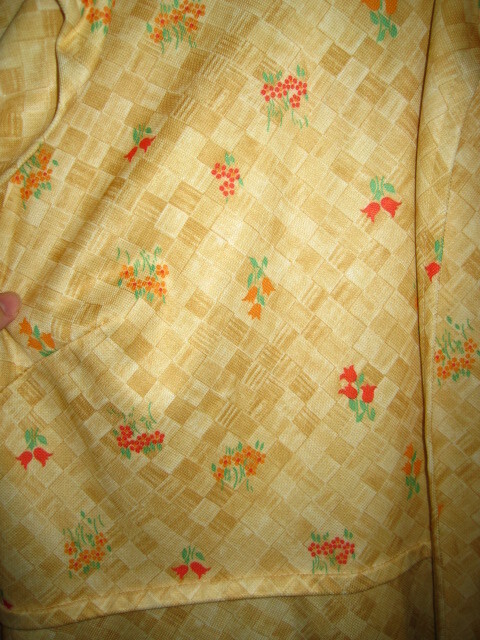 It also has a slight texture, which means it stays in place on the fabric. This stuff, combined with a new blade in my rotary cutter, made the task of cutting out the pattern much more tolerable than usual. It also helped that there was only one simple pattern piece. This skirt should have gone together very, very quickly, but I had about a million stupid problems. First, I had issues with my serger. It turned out that I had made a mistake when threading it, which resulted in the threads coming loose from their proper place in the machine. Then, one of my spools of thread ran out. Then I did something else incorrectly (I’m still not sure what) that messed up another seam. Since I had to reserge in a few places, the skirt ended up being a bit smaller around the waist than it should have been. The directions said to use elastic in the waist, but the stretch of the skirt seemed fine without it so I skipped that step and just folded down the waist and hemmed it. I switched to the regular sewing machine for the hem and had problems with my bobbin. After pulling out some stitches, I finally got it right. I was getting frustrated and things were coming out a bit uneven so I decided to leave the hem for another day. Anyway, it was still a quick project but it took about twice as long as it should have due to various problems, most of which were caused by my haste. The waist looks a bit wonky in this photo but it doesn’t look that bad in real life–I just didn’t bother to straighten it enough before I took the photo. When hemmed, it will be mid-calf length. I don’t have many skirts that are this length and I figured it would be good for some traveling I will be doing this fall. This was so easy that I’ll definitely make it again when I find some more knit fabric on sale. It’s a nice, basic skirt. My next project is a wrap dress for my mom. I was planning to start it tonight but I wanted to do this quick skirt first to make sure I’m comfortable enough with the serger to make something for someone else. Good thing I did, since I had so many issues. 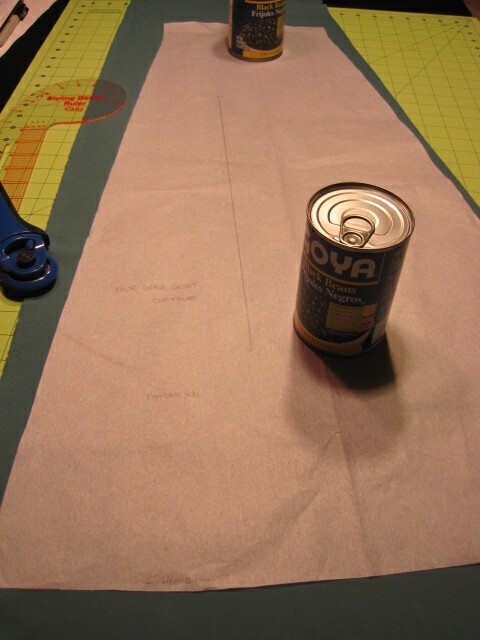 I’ve already traced the Simplicity wrap dress pattern onto the pattern paper and I hope to start cutting tomorrow night. I have the fabric but I still need to find a suitable buckle. The color is a bit off in this photo–there isn’t quite that much color contrast between the neck binding and the dress. I can still put it on without unzipping it, but I didn’t want it to be too tight because clingy polyester is uncomfortable in the heat. The armholes are still a bit funky, but I don’t know if I can do anything about that, so I’m leaving them. I can’t wait to wear it–I think it will look good on its own in the summer and with red tights for fall. I wish I had another wedding to go to this summer because my mom gave me some gloves that are exactly the same yellow as the quilt binding I used on the neckline. 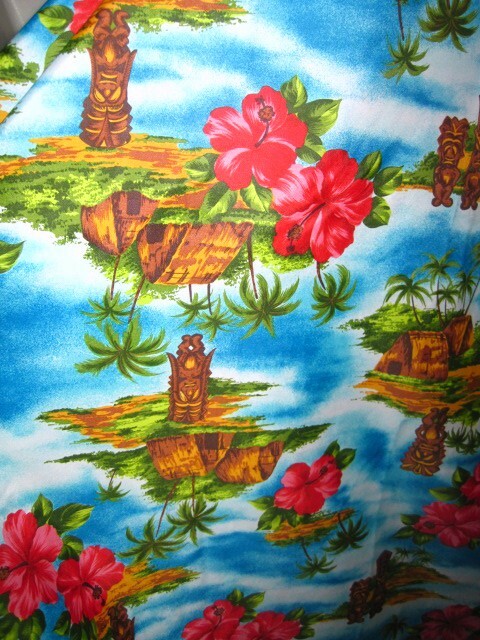 Here is a detail of the pattern. Total cost: $2.69 for the dress and about an hour of time. I took it in a bit along the front seam and the fit was better. Next I started a belt; I decided to just go with the same fabric as the dress and used an ancient belt kit from the stash of stuff I got at the garage sale a week and a half ago. The belt was fine, but really boring, so I added a bow. I think I like it, but I’m not sure if it’s too twee. I also bought a big satin flower pin today at the fabric store for $1.99. I tried adding that to the belt, but I think it’s too much, even for me. The flower matches my shoes, so I might use it somehow–maybe in my hair? I also decided not to make a purse because I am frankly really tired of working with this satin. I realized that I already have a bag in my collection that will work fine. I am a bit frustrated with this project and am wondering whether I should just wear another dress; perhaps this one is too homemade and embarrassing. I think I need to set it aside for a while and decide when I am less irritated with it. I am currently working on a dress to wear to my brother’s wedding later this month. After much deliberation, I decided to use Simplicity 9221 from c. 1971; this came from the new stash of patterns that my dad recently brought me. 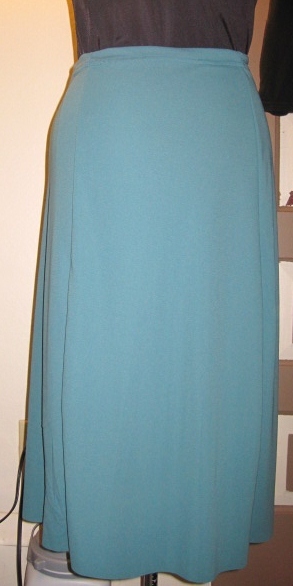 I liked the simple but interesting neckline, the front seam, and the fact that it looked pretty easy to put together. I chose view 2 because I don’t have much experience with sleeves and I didn’t want to experiment too much with this project. 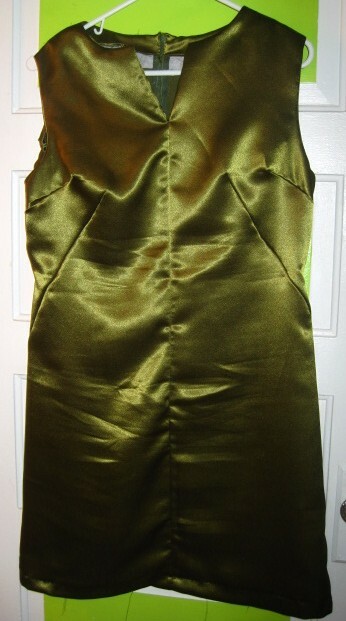 For the fabric, I had a very specific shade of green in mind–something like a combination of olive and chartreuse. I was hoping to use a brocade, but none of the brocades I found was exactly what I was looking for. The only thing I found in the color I wanted was a satin. I wasn’t sure about working with satin, but it was on sale for only $5 a yard and the color was perfect, so I bought it. I was afraid my pattern would be a bit small, so I traced a pattern that I’ve used before over the bodice from underarm to hip. The other pattern had a slightly different and deeper dart at the sides, so I used those darts instead. Everything seemed to go together fine, but rather than being a bit tight, it is actually slightly big. I will have to take in the waist a bit. As you can see, it looks rather shapeless, like a big, shiny pillowcase. I have not pressed everything (guess who hates ironing?) and I still have to do the armhole facings, finish the neck facings around the zipper, and decide on a hem length. I think I’ll shorten it a few inches. I hand-picked the zipper after seeing a tutorial online. I think it came out okay, but the stitches pucker a bit. It still looks better than most of the other zippers I’ve done. I might add beading if I have time. I am also planning to make a belt and a matching bag, though I can’t decide if I should make them out of the ivory satin I bought last week or if they should match the dark red shoes I’m planning to wear with it. I’m really hoping everything turns out okay, as I don’t really have time to make another dress!